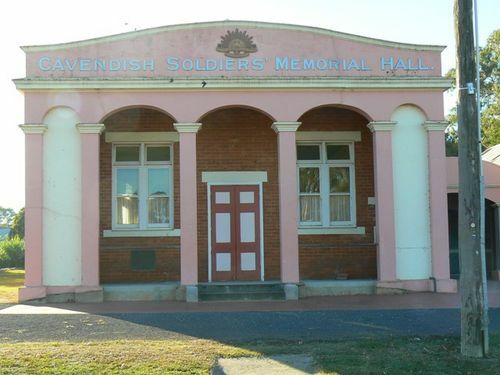 The Soldiers Memorial Hall was built to commemorate those who served in World War One. An interesting ceremony took place at Cavendish last Monday before a large gathering, when the Memorial Hall was officially opened by Mr. John McNeil, M.H.R. The hall, which was built as a memorial to the soldiers and sailors who fought in the war, is to be used as a public hall, not exclusively for soldiers, as was done in many centres. Being of brick, well ventilated and lighted, it is a decided asset to the community, the erection costing approximately £2000. Among those present were Mr. A. S. Rodgers, who addressed the gathering, and local councillors. Mr. Stanley Learmonth occupied the chair. Horsham Times (Vic. ), 19 December 1924.